This website is in the process of re-development. Some links are not working correctly yet. Please bear with us. ADS is not limited to these dimensional measurement scenarios but is committed to providing dimensional measurement solutions to meet clients' individual and special requests. Please do not hesitate to contact us . We look forward to being of service to you. 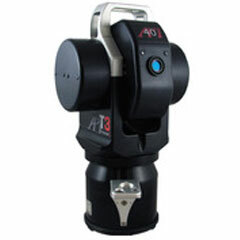 A 3D Laser Tracker is a portable co-ordinate measuring machine (CMM) for situations where the item to be measured can be touched or a reflector attached to it. The "Laser Tracker" is leading edge technology for applications where the item to be measured is too large for a conventional co-ordinate measuring machine or is not able to be taken to a CMM or needs to be measured in-situ. Accutacies are better than ±0.025mm (±0.001inch). General Specifications: Our Leica precision Industrial Total Stations provide 3D accuracy to ±0.3mm (0.012inches), distance accuracy to 0.2mm (0.008inches) and angular resolution to 0.002mm/m (0.2mm/100m). These portable motorized measurement systems use an Automatic Target Recognition (ATR) to acquire the target automatically without having to sight it optically. Ideal for large-scale coordinate measurement, 3D alignment, machine tooling inspection and assembly tasks/projects requiring this level of accuracy.